©空木かける・comico/ミイラの飼い方製作委員会 / © 1995-2017, Tokyo Broadcasting System Television, Inc. All Rights Reserved. Sora Kashiwagi suddenly is faced with a big scary sarcophagus from Egypt. Noises come from its inside and when its door suddenly opens… an adorable, tiny mummy comes out of it and doesn’t want to leave anymore. 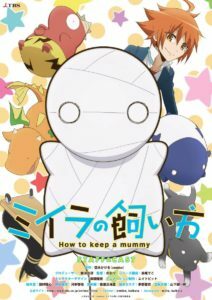 This anime is based on the manga How to Keep a Mummy by Kakeru Utsugi. 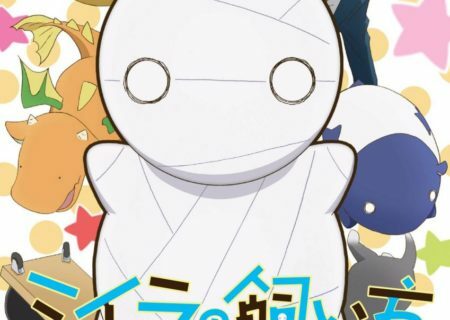 It has been serialized online via Comico since 2014. There have been four paperback volumes published so far, which were released by Futabasha from February 2016 onwards. It is also being published through Crunchyroll in English.